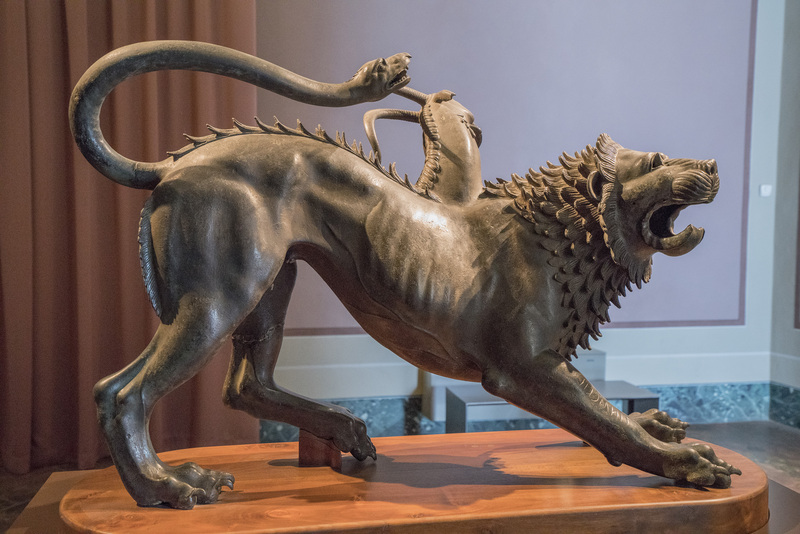 The Chimera of Arezzo is an ancient Etruscan bronze currently in the Florence Archaeological Museum, and dated to circa 400 BCE. The sculpture depicts the mythological Chimera, a hybrid animal consisting of a lion, with a goats head emerging from its back, and a tail in the form of a snake. The bronze was unearthed in 1553 and claimed for the Medici collections in Florence. On the right foreleg of the lion is an inscription, implying that the sculpture served a votive purpose in antiquity.